At Salute I saw a lot of wonderful things, but each game system seemed to follow a similar path of a needing a large rulebook costing about £20, so it’s nice to see a different approach in Valhalla, published by East Street Games. 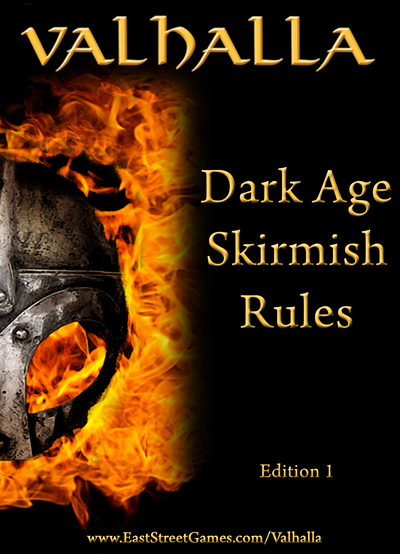 A Viking era skirmish game, harking back to the idea of cheap rule sets, no fixed model range and an emphasis on modifying as required rather than sticking to the letter of the rules. It also has a unique online component built into the game, whereby you generate your warband, record any experience gained, and can then watch it grow with each victory. As for the rules themselves, well they’re pretty solid, albeit with a few glaring holes that, at times, may be irritating. The most interesting of them is that you have several lines of health boxes which means, as they are filled in due to injury, a fighter gets progressively worse at fighting to represent having taken a few blows. Games focus around ‘benches’ – groups of warriors commanded by a powerful leader who sets the morale and tells the warriors what to do. Each turn models have three action points to use which each model must use before moving to another, making turns quick and fast even with a dozen models on the table. In a nice nod to realism, you set your warriors tasks at the beginning of the game such as ‘burn those houses’ or ‘capture those villagers’ which your warriors won’t deviate from unless provoked, so its even possible that games could happen and warriors not encounter a fight at all, or else a crafty defender could pick off an opponent from afar before they have time to react. Sod the historical realism though I hear you cry- how good is the combat!? Pleasantly brutal I have to say. Evoking the fast and deadly nature of hand to hand combat at the time, heroics by single models will result in a quick death for them as they get surrounded by enemies. So players with lone models caught off guard have to resort to stalling tactics until their friends turn up, or else risk running away. It’s for a good reason that Valhalla insists you start a game together as one bench. Teamwork is the name of the game here. Now to talk about the online component, it’s pretty easy to set up and generate your own warband. Upload pictures of your models, choose what nationality you would like (Cornish, Saxon, Viking etc), the type of warrior you want, generate your models stats and then choose weaponry and equipment. Each page is dedicated to a single task, so you are never confused about what to do or how to do it and its a pretty quick process, with my two bands of Cornish and Gailic warriors (each 8 models strong) being generated in 30 mins. Now the online mode is handy, but it also reveals some of the drawbacks of the method. For one, it relies on the East Street Games having the time to update the game as it promises it will. The rulebook itself has no scenarios in it and none on the site as of this time, so it would have been useful to have a few in the rulebook to get peoples imaginations going and tide them over until East Street Games found the time to upload a few more to the website. The reliance on the site for keeping track of each models generation, growth and equipment may irk a few used to doing that with pen and paper after each game. There’s also a few formatting errors in the rulebook that were very obvious and should have been caught by someone before printing happened. Overall though, Valhalla is worth your time. Its a game that will reward you the more time you put into it if you are willing to meet it half way initially. The solid base of rules and encouragement of modding and changing the game yourself is an attitude I wish more game developers had. If there’s a Viking era skirmish game worth trying today, try Valhalla. You’ll be pleasantly surprised at both the depth to the rules and at how cheap the game is, probably being £50+ for the two warbands of 12 warriors a side (depending on where you buy them) and a core rules system that should only get better with time. Not bad for rules that only cost me £5. Valhalla is available from East Street Games.